Tricky request on this one! The customer wanted the blast to be exposing Wolverine's skeleton... and yet Wolverine should not be "blasted backward". Honestly sounds like two different ideas to me! Well done, JB... you made it work. Feels like there's been more smaller requests the year (I am excited for my upcoming 11x17!) -- any large commissions currently on the list, JB? …any large commissions currently on the list, JB? Several. Currently on the board (and for a while, with other things happening around it) is a 30x40 for Jim Warden. Beyond that, an 18x24 and a 20x30. It's up to about 30 commission so far this year (only some of which you have seen thusfar), which is ahead of last year. Maybe the recession realy IS over! Sweet! The more commissions the better. I am on track for 2 or 3 this year. It will be good to be back in the game! 30x40! WOW! I'm excited to see what Jim is getting! Way cooler than bone claws, most especially because bone claws contradict established continuity. Easy to forget that Days of Future Past was only two issues. It would be beating a dead horse to discuss how many issues such a story would occupy today. Let's just recall how much awesomeness JB and CC fit into those two ... and, sadly, how much Claremont and others later mined for stories I, for one, found byzantine, alienating, and self-indulgent. But, y'know what, I don't need to read those stories. I can just read DoFP and enjoy that, all by itself. All because of the "incestuous lesbian kiss", as it came to be known. Wondering what you (and the rest of the JBF) thought of this ad for the issue, JB? I found it very... odd. That ad is no worse, really, than the stupid copy they put on the cover of the actual issue. Nothing like taking a dramatic moment and turning it into a joke! If it's any consolation, I can guarantee you that this eleven year old didn't see any humor in that cover copy. That ad is so weird! The tone is off. The character is off. Why would that ad make anyone want to buy the book? I got to thinking about that claw mechanism John drew for the DoFP Wolverine in that issue. 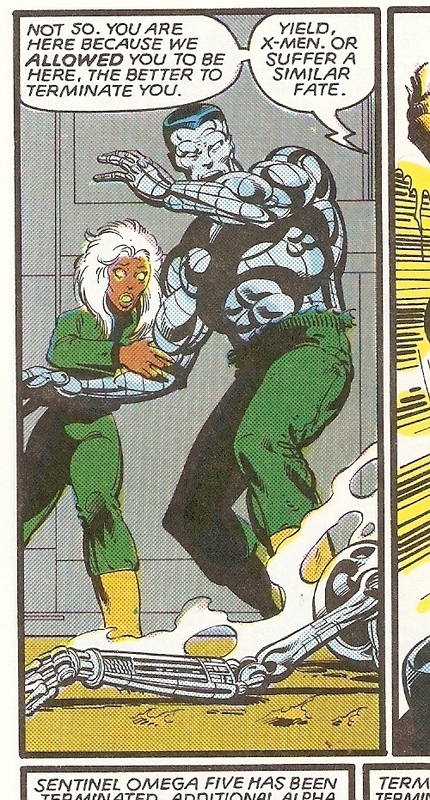 Basically, we have a mutant who was partially transformed into a cyborg. How we went from that to the claws "always being there", I think was part of that lazy writing/artist syndrome setting in during the 1990s. I still scratch my head when I think about that issue of Wolverine's comic that closed out the whole "Fatal Attractions" crossover in the mid-1990s. 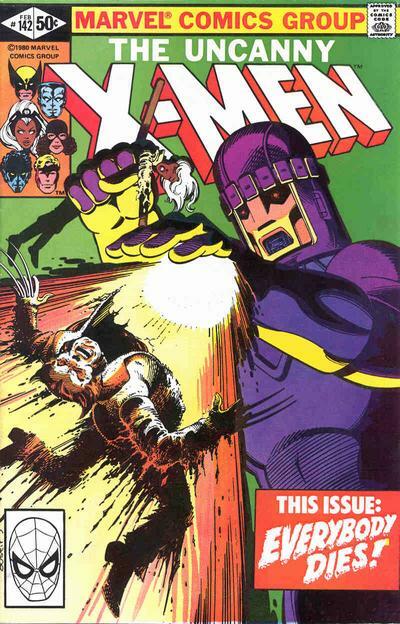 It followed closely on the "Weapon X" story that Barry Winsor-Smith drew in the Marvel Comics Presents anthology that ran a few years earlier, in which we were first introduced to the idea that he wasn't exactly a cyborg (the claws formed on their own while the adamantium-infusion process was being done, as if the body was trying to reject the metal). The bionic claw mechanism makes more sense to me. Chris had it in mind that the claws were part of the mutation long before that. aren't even in the same realm. JB, I marvel at your ability to make the motion lines and blast lines "just work"! Mutants had one extra power, I thought. Well, at least they got rid of the last one! LOVE this piece! Visible machinery/gears is one of my favorite Byrne motifs. Noah: "Easy to forget that Days of Future Past was only two issues. It would be beating a dead horse to discuss how many issues such a story would occupy today. Let's just recall how much awesomeness JB and CC fit into those two ... and, sadly, how much Claremont and others later mined for stories I, for one, found byzantine, alienating, and self-indulgent. But, y'know what, I don't need to read those stories. I can just read DoFP and enjoy that, all by itself." I couldn't make it through Cockrum's second run - it was just too awful. I dropped the book and only went back for random issues that never did much for me. But I re-read the JB issues a lot, as well as Cockrum's first run which I still like. Reading JB's FANTASTIC FOUR at the time of release, it became clear to me that it wasn't just JB's art that I liked. The storytelling that hooked me in X-MEN was happening in FANTASTIC FOUR. Nathan G: "That ad is so weird! The tone is off. The character is off. Why would that ad make anyone want to buy the book? And I have never understood the part about Kitty? What does the "real small part" mean? I'm missing the joke..."
I've never seen the ad until now, and it is truly bizarre. I like that Marvel's subscription ads were funny and playful, but an ad for such a serious story should have the same tone reflected in the marketing. Maybe that Sentinel was a Steve Martin fan. Maybe they were going for sardonic but it didn't quite work. Totally agree with the observations on that ad... felt the same as a kid when I read it. I think for me the biggest problem is that if you're going for sarcasm or irony (which is already misplaced as stated above given the seriousness of the story), you shouldn't also have a notoriously humorless Sentinel be the one delivering the lines. and the Sentinel is smiling too! Odd "humor" was about to become a trademark of the X-Men, once I departed. Remember the "Bamfs"?